“Flexitarianism” is the hot new term for healthy dieting that minimizes meat without excluding it altogether. This is an inclusive eating plan, meaning it does not take away foods but rather adds new foods to those you already eat. 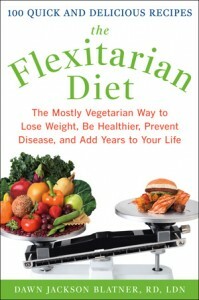 The Flexitarian Diet gradually guides you to eat more veggies while still enjoying your favorite meats. Flexitarians weigh 15% less, have a lower rate of heart disease, diabetes and cancer, and live 3.6 years longer than their carnivorous counterparts. As the name implies, it’s all about flexibility, giving readers a range of options: flexible meal plans, meat-substitute recipes, and realistic weight loss tips. Plus it’s a great way to introduce the benefits of vegetarianism into every family’s lifestyle.